Seven minutes go by rather quickly in Affalterbach's new top dog. 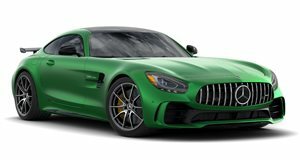 The new top version of , the Pro model packs the same 4.0-liter twin-turbo V8 as the "standard" GT R, producing the same 577 horsepower and 516 lb-ft of torque. But it's been further enhanced with a stiffer, more adjustable suspension, along with more extensive use of carbon-fiber, its own set of lightweight forged alloys, and more aggressive aero for additional downforce and better balance at speed. The result, aside from that blitzkreig Nordschleife lap time, is a 3.5-second 0-60 mph time and a 198-mph top speed. And that, in turn, makes it the most extreme track tool AMG has made yet. That's quite the crown, considering what the boys in Affalterbach have made in years past. But it may not be top dog for long, though. They're still said to be working on an even , and the forthcoming promises to blow the doors off not just everything that's ever worn the Silver Star before, but anything the industry has ever produced. And we're looking forward to seeing what those two highly anticipated new performance machines will be able to do in the right hands at the Green Hell as well.